Students are very proud of their permaculture garden and like to think that their garden is of a high standard. Entering a competition gives us a chance to reflect on our garden and how we set it up and why we set it up the way we did and what were the key factors in the garden and why. When the judges arrive, I stay away and let the students take the judges through the garden, if I stay in the garden, the students will keep looking to me for answers, without me there, they will remember why are permaculture garden is so effective. The students will explain the processes and design. You have to Walk the Talk, not only do you need to know about everything in your garden but how it all interconnects, for example food scraps go into the worm bath, this reduces the amount of waste going to the tip, but more importantly, this food scraps are a very valuable resource to us, they feed our worms which produce worm castings. The castings are used when we plant seedlings, these castings not only feed the plant with nutrients but also have a high water holding capacity therefore reducing watering needs, less water being used, less time being used to water. The students need to have an understanding of the processes and an understanding of the reasoning behind it. Awards can be important! ENORMOUS PRIDE I'm surprised you haven't heard them cheer from where your sitting. From the initial response of exitement to the media following through with the story, TV and newspapers. The students are so proud and they feel very important, famous even. It's positive for all involved - the school, the students, parents and teachers and especially for me. It's good to know that I'm on the right track and it gives me an energy boost to keep up the work I'm doing. Years ago when I first had the idea to set up an Edible School Gardens program, it was suggested that I drop the idea and go and mow lawns as the program would never take off. I have had to work hard and ignore lots of those types of attitudes and prove that what I do is important to our childrens' health. Entering competitions exposes me to a wider community, especially winning and being in the media, people suddenly take you seriously and begin to value what you are doing. The award was a huge congratulations that what I was doing was a positive contribution to the community and that my work was recognised as being a valuable program that works. 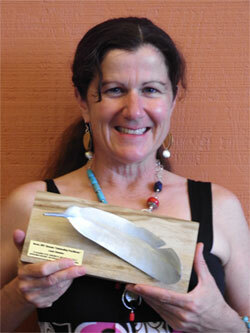 A special award was presented to Leonie Shanahan of Edible School Gardens at this year Glossies awards. Leonie was presented with a 'Recognition of Achievement' Award for her outstanding work in schools on the Sunshine Coast over 10+ years. 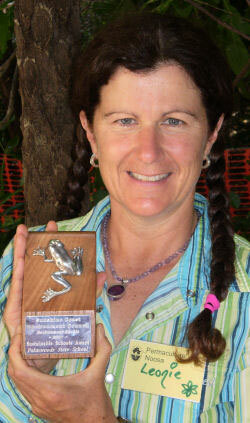 In recognition of the sustainable practices of Palmwoods State Schools permaculture garden. 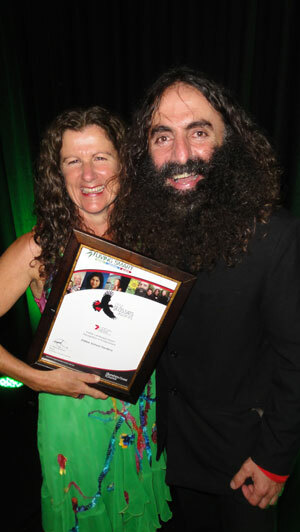 SCEC awards are presented annually to promote environmental excellence and sustainability by recognising outstanding achievements of the Community, Business and Government Sectors on the Sunshine Coast. The Green & healthy schools is open to all Qld schools. Whilst the program encourages new activities, it recognises that many schools are already undertaking activities that are directly relevant to the goals of the Green & Healthy Schools program. The program rewards activities that tackle issues such as environmental protection, litter prevention, resource management, waterwise initiatives, youth initiatives, health, nutrition and fitness and community partnerships and action.